So I have slacked on my blog here at the end of summer. Our schedule just exploded on us at what seems like all of a sudden although I knew it was coming. I think I was in denial. So quickly let me combine our last 2 weeks of summer. Over the last 2 weeks Bryan has had volleyball practices, middle school volleyball tryouts, gone to Virginia Beach for USA Beach Nationals, reported back to school last week, had a high school volleyball camp and held high school volleyball tryouts. He has been one very busy guy to say the least. I would post a picture, but I was at none of the above events so just imagine it in your head. On July 22nd our little man celebrated his 7th birthday. Bryce decided he wanted birthday breakfast so we headed to Cracker Barrel (his choice) for his birthday dining celebration. Before we got in the car the girls ambushed Bryce with silly string. 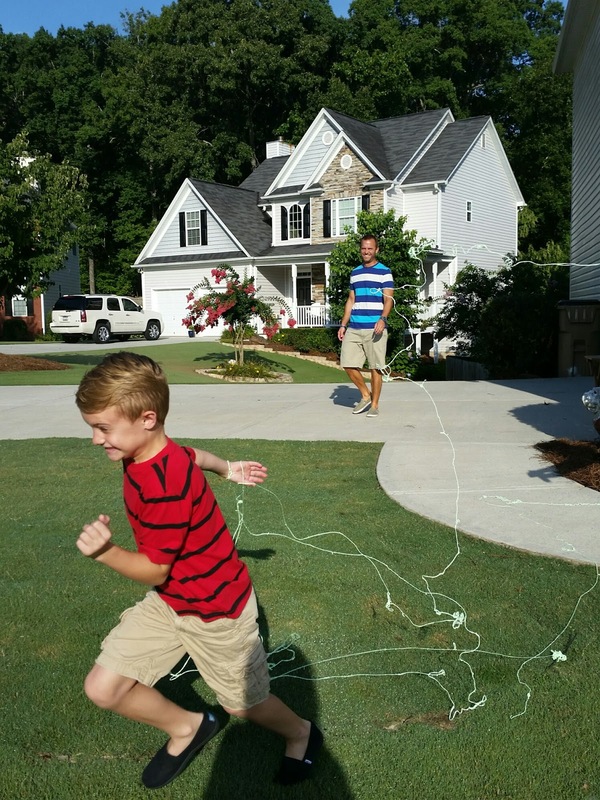 Nothing says happy birthday to your baby brother than attacking him with silly string. The boys got haircuts after breakfast and then back home we went for Bryce to open his gifts. The kids and I spent the rest of that week and weekend at the pool since Bryan headed to Virginia Beach. I figured we would squeeze a few more visits in at the pool before it was back to school. All of us even spent-the-night at Cece's one night so we didn't have to drive back and forth. The kids thought it was so cool that I stayed the night with them. Working on a back flip. By the end of the day she had it. 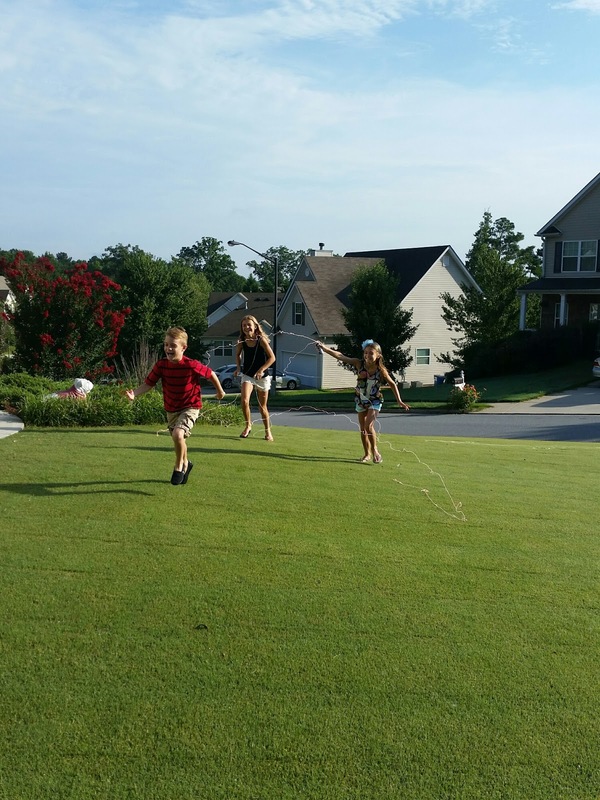 The last week of summer arrived for the kids. Bryan headed back to work, which always gets me down. 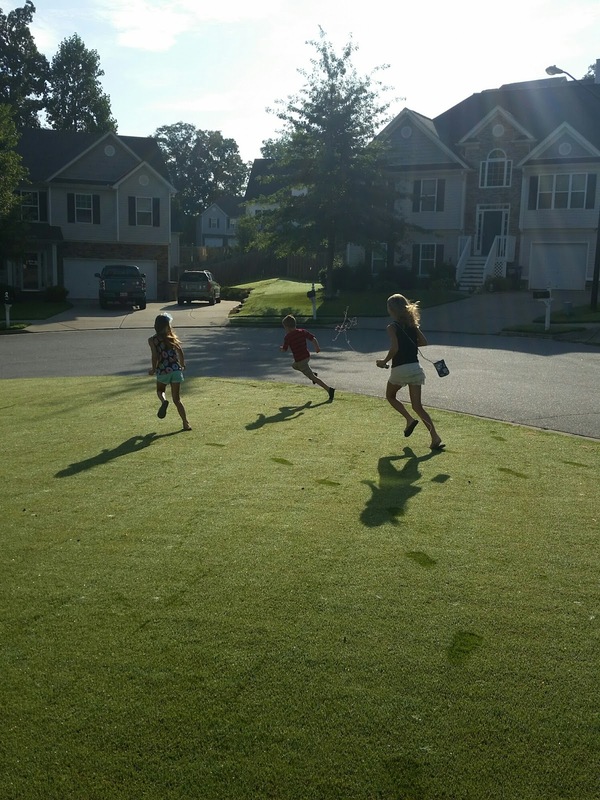 I didn't have too much time to mope because I had so much going on with getting the kids ready for school. PLUS the girls had team soccer camp all week in the evenings. Holy cow y'all...it was HOT!! Towards the end of the week the kids all had their school Meet & Greets. Thankfully Sydney's was on a different day. The kids are all thrilled with their classes and relieved to see some familiar faces. Finally to round out our summer we had a birthday celebration at the pool on Sunday for Pop and Katie. Dad and Katie's birthday are August 8 and 9, but Sydney has a soccer tournament that weekend so we figured this past weekend would be the best time to celebrate. Pool time, family, food, homemade banana pudding and cake were the perfect way to round out the last day of summer vacation. We played an intense game of Categories. Our current favorite pool game to play. Bryce completely ran around the pool and jumped in to make his tag. Not quite how it works, but I give him points for effort! So long summer vacation. Hello school. Happy Birthday to Pop and Katie!